A comprehensive program that will take someone who has zero slacklining experience to be able to walk longer and higher lines until they can highline, if they so desire! It covers everything I’ve learned the past several years and is continually updated with more skills as my own skills and understanding build up. It is filled with not only tips about walking, but also full of a bunch of skills, transitions and really cool moves so that you could get really deep in the slacklife. What’s the format of the program like? The program consists of 16 tutorial videos with lots of supplemental information, just like my blog posts. All of it is organized meticulously and it is updated continuously as my own abilities increase. When you buy the program, you will instantly receive a username and password and be able to access the program through this website. I’ve been slacklining since 2011. I am part of the community at the Santa Monica Slackline park which attracts some of the most highly talented slackliners in the world who teach me and inspire me constantly. Everybody supports and inspires one another to always do better. I do have a knack for breaking things down and teaching them, so that is why I’ve created this! Is there any info on rigging up lines? 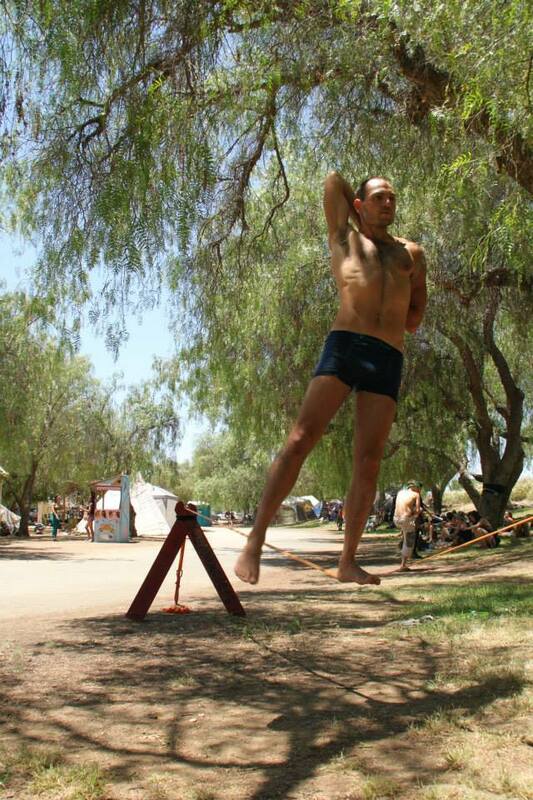 If you have a 1″ line, I detail how to setup a primitive slackline in this blog post. If you have a 2″ line, read the instructions on how to tighten the ratchet. If I don’t have a slackline, what would you recommend? If that is too expensive for you and are looking for an affordable line, this 2″ Rebel slackline is pretty great for the money. I’ve tried it many times and it’s quite good for the money (only $35). Does this slackline program apply to only 1″ lines or 2″ lines? All the advice in this program is applicable to any kind of slackline whether it’s a 1″ or 2″ line or anything in between, the same concepts apply. As you could see, this comprehensive program consists of a wide array of skills, with great emphasis on the basic and intermediate skills. I will keep updating it with more skills and resources as my own skills increase. If you are having trouble with something or just aren’t sure if your form is correct, I encourage you to leave a comment or post a “form-check” video. Comments are enabled on all the pages so you could provide feedback and we could improve the routine together and I could help you at the same time. If you are a redditor, you can ask any question at /r/antranik and I will answer. If you don’t like the program for any reason, just contact me and I will give you a refund with no questions asked and no risk to you.